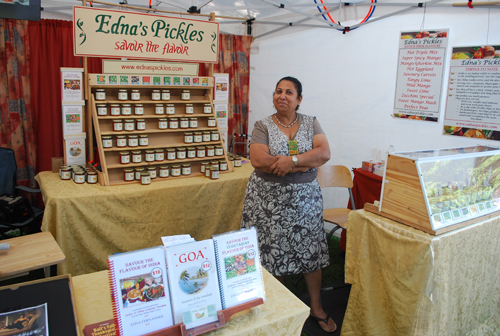 Edna makes to most delicious pickled chutneys and relishes EVER! Edna has always loved making pickles in various flavours, creating new blends and trying out new techniques. With interest in the culinary art, she was encouraged to promote her home-made Indian pickles, curries and sweets at community events. In 2004, she first showcased her pickles at the One of a Kind Spring Show in Toronto. Since the response was overwhelming, she continued to exhibit at various Art & Craft Shows in Ontario including the upcoming Artfest Toronto show at the Distillery. With a natural flair and love for cooking, creating new recipes by experimenting with various methods, she also published her own recipe book 'Savour the flavour of India' - a collection of tried and tested Goan and other Indian recipes. Over the years, she has continued to attract and establish a satisfied clientele. Her aim is to pursue to create ideal quality homemade products, addictive enough to have people coming back for more.